Kerry Group, the global taste and nutrition company, has opened its first plant in Russia, in the Istra district of Moscow. The new production and warehouse complex occupies a site covering more than 7,000 square meters and employs over 50 people. Production begins immediately with ingredients for the meat processing and snacks market. At full capacity, the plant is designed to produce 26,000 tons of products per year to meet increased local demand for products that meet local consumer taste and nutrition preferences. 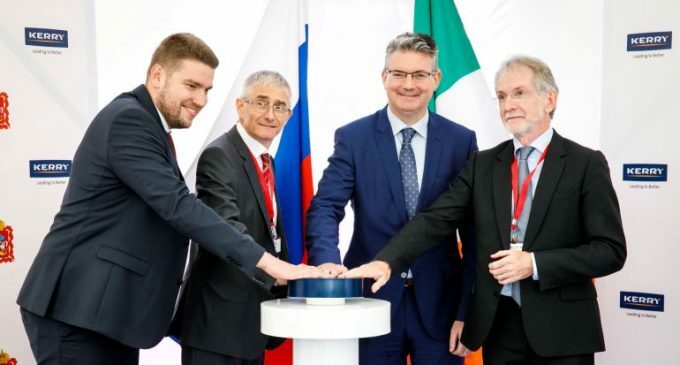 The facility was officially opened by Minister for Agriculture for the Moscow Region, Andrei Razin and Edmond Scanlon, Kerry Group Chief Executive. Pictrued (from left to right): Andrei Razin, Minister for Agriculture for the Moscow Region; Olivier Picard, Managing Director of Kerry Taste & Nutrition Russia; Edmond Scanlon, CEO of Kerry Group; and Malcolm Sheil, CEO of Kerry Taste & Nutrition Europe & Russia, pushing the button to start production at the Moscow plant.